Nestor Alexander Haddaway (born January 9, 1965), better known by his stage name Haddaway, is a Trinidadian-German musician best known for his 1993 hit single “What Is Love”. 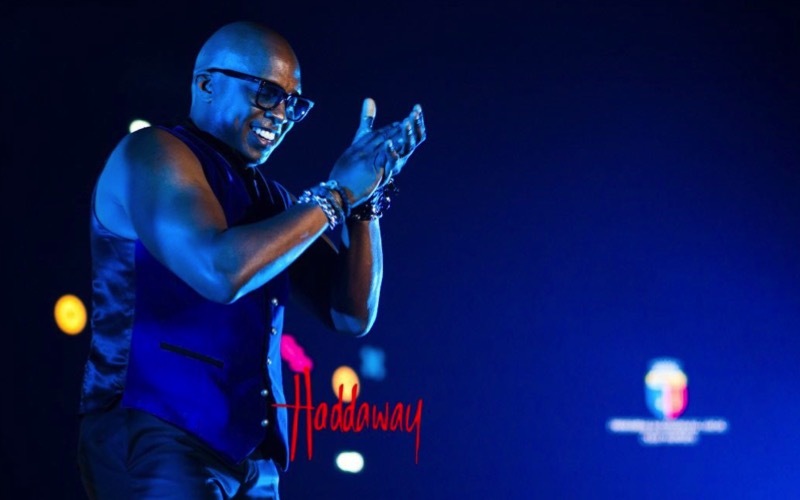 Born in Trinidad and Tobago, Haddaway moved to the Washington, D.C. area at the age of nine, where he grew up to the sounds of Louis Armstrong, which encouraged him to learn how to play trumpet at the age of 14.He attended Meade Senior High School. This eventually resulted in him forming his first group which he called Chances. Haddaway moved to Cologne, Germany in 1987 where he mostly worked in bars. Haddaway’s break came in 1992 when he was signed by German label Coconut Records. His debut single “What Is Love” rapidly became popular in Europe, reaching number 2 in Germany and the United Kingdom.In Germany, the single sold 900,000 copies, in the UK, it was certified Gold for shipment of 400,000 units. It later reached number 11 on the Billboard Hot 100 and was certified Gold for shipments of 500,000 units. By the beginning of 1994, worldwide sales of “What Is Love” had already reached 2.6 million. His second single “Life” hit number 2 in Germany, number 6 in the UK and number 41 in the USA, and its worldwide sales had reached 1.5 million by 1994. The follow-up singles “I Miss You” and “Rock My Heart” were also top 10 smashes in Europe and established him as a successful Eurodance artist. His first LP, The Album (also known as Haddaway in the USA), was a multi-million seller which reached Platinum status in Germany for shipments of 500,000, and Gold in the UK and in France for shipments of 100,000. In 1995, he released his second album The Drive, which spawned the UK top 20 hit “Fly Away”, as well as “Catch a Fire” and “Lover Be Thy Name”. “What Is Love” enjoyed a resurge in popularity as the theme music for the head-bobbing, nightclubbing-addicted Butabi brothers (Will Ferrell and Chris Kattan) on Saturday Night Live and the subsequent film A Night at the Roxbury. Haddaway’s subsequent albums were more soulful, but since 1998, the singer has struggled to repeat the mainstream commercial success of his early hits. Albums Let’s Do It Now and My Face (the latter re-released as Love Makes) all failed to chart, producing only a handful of moderately successful singles.